I also love how big their hearts are. My youngest is so affectionate and will snuggle in close and kiss me frequently throughout the day. My oldest is a bit more subtle in her demonstrations of love and will often leave a drawing or note. 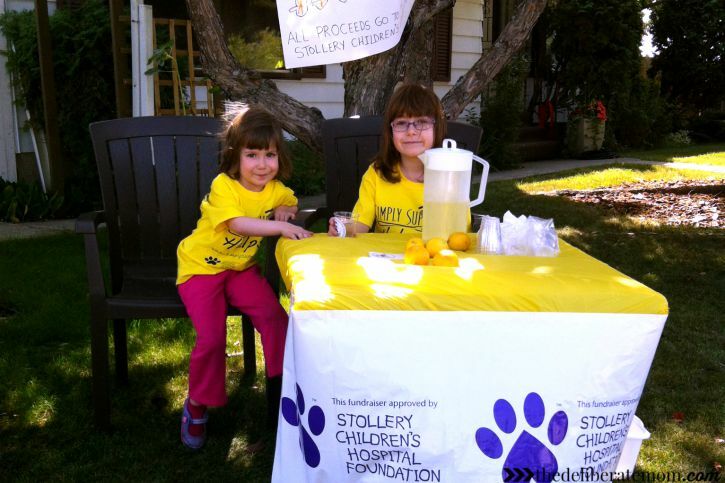 This past weekend, my girls participated in the city-wide Lemonade Stand Day to raise money for the Stollery Children’s Hospital Foundation. My girls raised $72.05 in the 4 hours that they ran their lemonade stand! I was so proud of their hard work and I can’t wait to drop off the proceeds this week! One evening, I stole away from the house all by myself. It had just rained and the air was fresh. As I was driving, a rainbow appeared in the distance. I did something I haven’t done since I was a little girl… I chased the rainbow. I drove until I couldn’t drive anymore. I parked the car, sat down on a bench, and took in this scene. 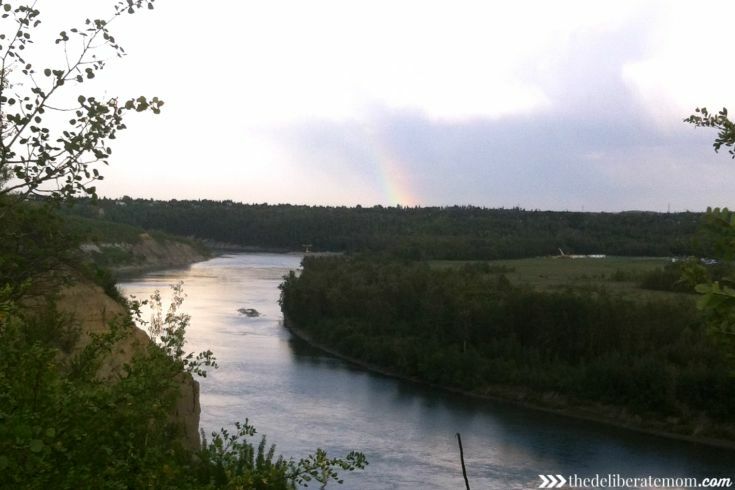 The rainbow had faded, but the nostalgia of chasing a rainbow resonated with me in the days that followed. I don’t know when I “grew-up” but I do know that there are whimsical things that I don’t have to give up because I’m older. I can dream! I can reach! I can chase that rainbow! It’s been a wonderful month full of amazing moments! I’m eager to see what September has in store for us. « « How to Plan the Ultimate and Most Productive Blog Staycation Ever! Thank you Janine! Yes, the story about my grandma still resonates with me a week later. It’s one of those moments I’ll never forget. I couldn’t believe that story about your Grandma when I read it on Facebook! Amazing! Stunning, beautiful! It’s an amazing story. I’m sure I’ll tell it for the rest of my days. I felt so inspired and invigorated when I chased that rainbow. It was awesome. The mismatched shoes and the Mona Lisa drawing = incredible. Of course the miracle story is my favorite. It reminds me of my grandmother who lived until age 100 and was still planning her menus out (including dessert) until the very last day. There’s magic in that coffee, I tell ya! I’m the queen of mismatched shoes. The more Toms I buy, the more it happens – lol. I thought the Mona Lisa drawing was awesome. My girl is quite comical. Our miracle was amazing. My granny is pretty awesome – sounds like your grandpa was just as spunky as she is. Wishing you beautiful things in September! Praise God! I love that your grandma is better! So awesome!! So glad you got a mini getaway – those are the best!!! God is so good. My grandma’s still not well, but she’s far better than what she was at last week. We didn’t get to go on a family vacation this year, so our one night away was perfect! This is a lovely post. So much to be thankful for! I’m glad I stopped by. Yes, August was certainly a blessed month. I had a lot to thank the Lord for. That’s so amazing about your grandma Jennifer. A true miracle indeed. My daughter is a snuggle as well. I’m cherishing those moments as much as I can. It was an amazing month. I certainly feel blessed. I’m soaking up the snuggles… it’s delightful. She’s still not well but she’s fighting. She’s always been a fighter… ever since she was born 98 1/2 years ago at a whopping 1 lb. I kid you not, she was 1 lb. I wrote about her birth a few years ago. It’s remarkable that she survived. Hi Jennifer! What a lovely post! 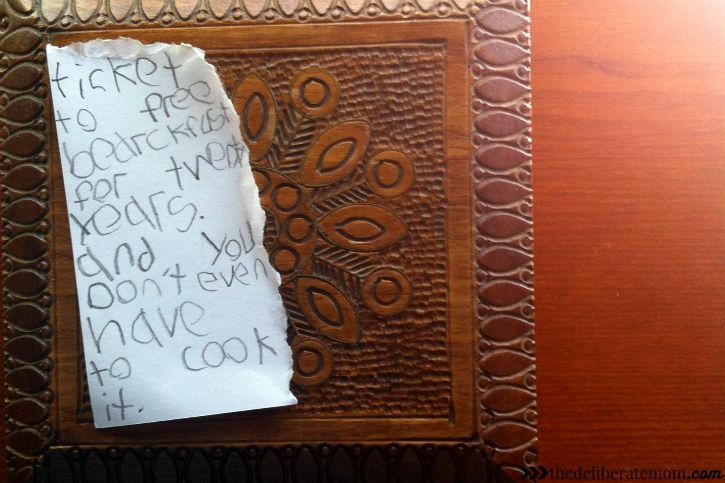 I love the free breakfast, as it’s my favorite meal…getting a nice hot breakfast for twenty years sounds AWESOME! I love the chasing rainbows thing too. What a great way to recapture youth, hope and fun. Wish I was there with you! Tim Horton’s coffee? YES! You have to report this to corporate. I see you being a spokesperson for them! On to September…who knows what Tim Horton’s will do next??? We’re starting to call this our “Tim Horton’s miracle”. Seriously… that lady loves her Tim Horton’s. It was a wonderful, blessed month. I’m eager to see what September… and fall brings. Wow, that was an amazing month! The story about your grandmother is incredible. Yes, it was an extraordinary month. My grandmother is a fighter. Would you believe that over 98 years ago she was born in a farmhouse weighing just 1 lb?! Amazing! This might be my favorite post of the week! All of it, from beginning to end, hooking me in with “the miracle of coffee” and leaving me with the desire to follow the stars or rainbows or whatever the day may bring. I’m delighted you enjoyed this so much Angie! Yes, the miracle of coffee. My grandma is a pretty awesome lady… and yes, chase those rainbows! Wow. What a truly miraculous moment with your grandmother and the Tim Horton’s coffee. Seriously, that brought the chills to me. I love this post and may start to do a similar one. I would think it helps to reflect positively and be grateful for the life we live. Have a wonderful September. I look forward to hearing how it goes for you and your family. I love doing these monthly updates, especially for the reason as you just shared; it’s good to be thankful. I just loved that story about your grandma. I’m so sorry that I haven’t been around much lately but August was not a good month for me at all. Now I wish my mom had some Tim Horton’s maybe she might have lived a bit longer. Your August sounds like it was amazing and I’m sure September is going to be even more so. I’m delighted you enjoyed the Tim Horton’s story – amazing stuff that Timmy’s! I’ve been thinking of you a lot and praying for you Amanda. Sending you much love and comfort.